In response to some requests I’ve received, today I’m going to focus on three punctuation marks—semicolons, colons, and dashes—that, when used correctly, can add flavor to your writing and paint a clearer picture of the message you want your readers to receive. He has a point—many people aren’t quite sure when and where to use the mark, so the easiest thing to do is to avoid it altogether. But I’m more apt to agree with President Lincoln: a semicolon can be useful, particularly when you have two closely related sentences and you don’t want to put a full stop (i.e., a period) between them. Nick Botelho, team lead, transfer of assets, will be taking the lead on Commonwealth’s weeklong campaign to raise awareness and necessary dollars in support of [Autism Speaks: Light It Up Blue]; he has big plans for a 50/50 raffle, including tickets to some favorite Boston sporting events. Originally, “he has big plans for . . .” was the beginning of a new sentence, but it is so closely related to the statement about raising “necessary dollars” that I felt it needed to remain part of this thought. Semicolons are also used with conjunctive adverbs—words like “however,” “consequently,” and “therefore,” to name a few. 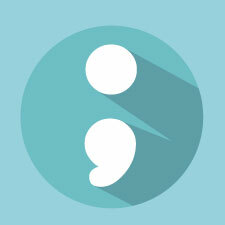 When the adverb is used to connect two complete sentences, it should be preceded by a semicolon and followed by a comma. The exhibit was set to open on Friday; however, some of the artists had yet to submit their work. Mr. Irving would probably argue against this usage as well, given how archaic he finds the semicolon, but in more formal business writing, I think it’s absolutely acceptable. Colons, on the other hand, aren’t nearly as maligned as semicolons. Colons are a great way to direct attention to a list after an independent clause—that is, a full sentence with a subject and a verb. Be sure to follow the colon with one space, not two. Double-spacing after periods was a requirement in the typewriter age; with today’s modern word-processing programs, it’s no longer necessary. Also, if the colon is used within a sentence (see first bullet below), the first word after the colon should not be capitalized unless it’s a proper name. If the colon is used to introduce two or more sentences (see second bullet), the first word after the colon should be capitalized. The dentist is always reminding us to do two things: brush and floss regularly. Jan is looking forward to her vacation for two reasons: First, she’ll get to see the historic sites; and, second, she won’t have to go to work for a week! Important vitamins for expectant mothers are: calcium and folic acid. There are a couple of important vitamins for expectant mothers: calcium and folic acid. When we talk about dashes, we’re usually referring to en and em dashes. The shorter en (–) dash (as opposed to the hyphen [-]), is used between numbers or words to indicate duration or range and is preferred as a minus sign for negative numbers. The em (—) dash is a long dash often used to denote an abrupt change in thought, set off a series within a sentence, or attribute a quotation to its author. Regional Bank is a great fund—did I mention that already? He ordered some supplies—notepads, pens, and highlighters—from Staples’ website. As I wrote this post, I made a conscious effort to use the various punctuation marks I talk about, not just in my examples but elsewhere in my text as well, so you can see them in practice. Of course, there’s a lot more to writing than how you use semicolons, colons, and dashes—you need ensure that you’ve organized your thoughts and customized your approach for the audience you’re trying to reach—but I hope these guidelines help you correctly incorporate more nuance into your articles, e-mails, and blog posts. Are you interested in reading more lessons in punctuation? What do you think you struggle with the most? Share your thoughts with me below.